Poet Walk; The Dove. Jessica Higgins, 2004. Casa De La Mujer, Solo exhibition, main space. Zaragoza Spain, May, 2004. 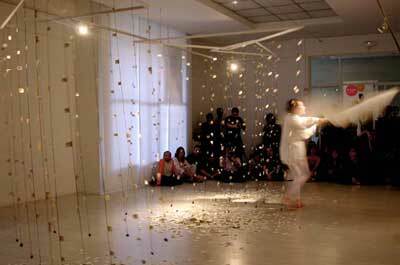 Inaugural performance and installation for Cambio Constante V. Artist organized by Arte En Orbita. Jessica Higgins brings us Poet Walk; The Dove an intermedia performance and installation derived from Poet Walk, an on-going work which spacializes the metrics of verse, in this case Haiku. 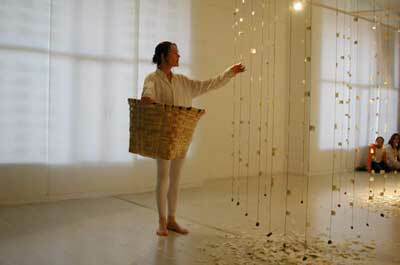 The viewer encounters suspended branches framing a forest of hanging text particles derived from original haiku works. As we move through the space, new texts randomly assemble themselves before us. The traditional five seven five metrics of Haiku are mapped to triangular zones of poem-space. 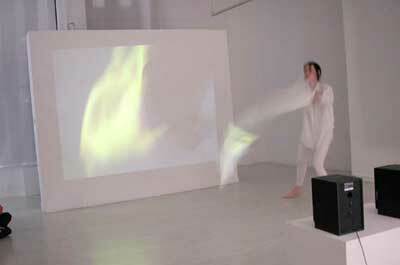 Ms. Higgins performs with two large piece of cloth as wings moving through particles of texts. 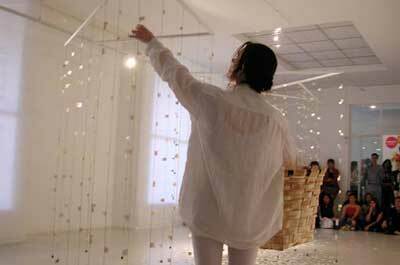 A video work by Jessica Higgins and produced by film maker George Souladze, is projected showing Ms. Higgins moving within a web of tangled Haiku texts. 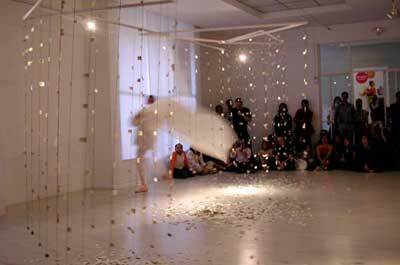 The two have previously collaborated on several video pieces for major festivals and art venues. Black lines and pieces of words are deconstructed into new forms against recorded natural sound. This message of peace expresses how another world becomes possible and leaves behind the finishing touches to her installation.